A young Mali without papers was acclaimed as a "hero" in France on Sunday, after a video watched by millions of people on social networks showed how he climbed in a few seconds four floors of a building to save a child who was hanging in the void. Mamoudou Gassama, 22, scaled a building without thinking after seeing the child in danger, a fact that occurred at 20:00 local time on Saturday (18:00 GMT) in the north of Paris. On Monday the young man was received at the Elysee Palace by French President Emmanuel Macron, who said he would grant him French nationality. Around 8 pm on Saturday afternoon, firefighters were alerted that a child was suspended in a vacuum on the terrace of a fourth floor of a building in the north of Paris. When they arrived, they discovered that a young man had saved the child, four years old. "Fortunately, there was someone with a good physical condition who had the courage to go and look for the child," the firefighters told AFP. The scene, spectacular, was recorded by passers-by. In the video, the man is seen climbing with his bare hands, arriving in just 30 seconds to the terrace of the fourth floor of the facade of the building. In those moments, the child was holding with one hand and was about to fall. Broadcast on social networks, the images became viral, and they received more than four million visits at the end of Sunday. Interviewed by the media one day after his deed, Mamoudou Gassama, 22, told his story. "I saw a lot of people screaming, and cars honking," he explained. "So I went up and, thank God, I saved him". "I was scared when I saved the child and then we went to the classroom. I started to tremble, I was not able to stand on my feet, I had to sit down," he added, excited. According to the first data of the investigation, the boy was left alone on the balcony because his parents were not at home. The reaction of Mamoudou has been very applauded and even the mayor of Paris Anne Hidalgo has thanked him on Twitter. "Congratulations to Mamoudou Gassama for his act of courage, which has saved the life of a child," Hidalgo said in her Twitter account after speaking with him on the phone to praise his work. "His heroic gesture is an example for all citizens and the city of Paris will do everything possible to support his desire to continue in the country," said the mayor. Such a feat deserved a high reward. The president of France, Emmanuel Macron, has not missed the opportunity and wanted to personally congratulate Mamoudou Gassama. 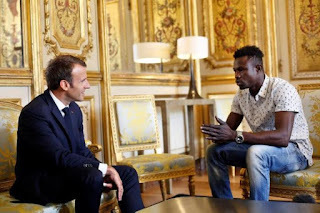 This Monday Macron has received Mamoudou in the Elysee Palace to learn first hand his story. "Bravo" was the first thing the president told him after having managed to climb the facade of a building in 30 seconds climbing without any help. "I did not think about anything, I climbed directly", the hero detailed. Macron has given this Malian a medal and a certificate of "courage and dedication", in addition to the promise that it would help him to legalize his situation in the country. The French Presidency confirmed after the meeting that the young man will have French nationality and will be part of the civic service of the city's firefighters. Physical conditions does not lack as it has been able to verify in the images already seen in the whole world. "It's an exceptional action, an act of heroism, I wanted to be able to make an exceptional decision with you," the president told Gassama visibly moved. Macron added that this is an exception since as a migrant who is not an asylum seeker, it should not be regularized. "We can not give (documentation) to all those who come from Mali, from Burkina Faso. When they are in danger, they are given asylum, but not for economic reasons," he said. "But as far as you are concerned, you did something exceptional, even though you have not thought about it, it is an act of courage and strength that deserves the admiration of everyone," said the president. With all the naturalness of the world, Mamoudou has told the president that he did not think twice about climbing the facade. He heard a lot of noise in the street, looked up, saw the boy suspended in the air and pulled his physical power to climb from balcony to balcony. "Until I saw the child safe I did not realize the danger of what I had just done," he acknowledged. Gassama arrived in France last September and this Monday he showed up at the Elysée in jeans and a short-sleeved shirt, accompanied by his brother and his girlfriend, with whom he took some photos with his own cell phone at the entrance to the Palace. According to the first elements of the investigation, the child was left alone on the balcony without his parents. The boy's mother was not in Paris at the time of the events and the father, born in 1981 and without a judicial record, was arrested in a preventive manner for having left his son unattended. The child was in charge of a social center. Reactions in France reached the whole political arc. Even the vice president of the National Front, Nicolas Bay said he agreed to regularize the young man for his "act of courage". He asked at the same time to expel "all the clandestine" in France.